We know you thrift shoppers love things that are historic . . . and are bargains! Here’s an outing in Orange County that combines these! 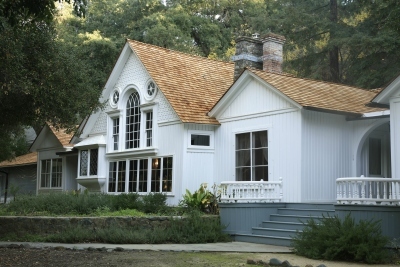 It’s a tour of “Arden” – the Helena Modjeska House, a National Historic Landmark built in 1888, in Modjeska Canyon. The docent-led tour is only $5.00 and is offered on the 1st and 3rd Tuesdays, or the 2nd and 4th Saturdays, every month. Madame Modjeska was the most famous Shakespearean actress in the country in the 1880s and 1890s. She and her husband, emigres from Poland, dreamed of owning a ranch in California. In 1888 they purchased the land in Santiago Canyon that would become Arden. Designed by the noted New York architect Stanford White and named for the magical Forest of Arden in Shakespeare’s “As You Like It,” Arden became an idyllic retreat where they where they could enjoy rustic ranch life and entertain a glittering list of celebrities of the day. Visitors will love the vintage furnishings, the oak-shaded grounds, and the legacy of an immensely talented, artistic woman. To make a tour reservation or learn more, call 949-923-2230. On a recent tour, our docent was dressed in a gorgeous vintage Victorian costume. You might want to check out the ALI thrift shop before you go to see if YOU can find some Victorian-looking clothing to put you in the spirit of Madame Modjeska!